WAM DUBAI, 2nd August 2013 – Emirates Airline has carried more than 18 million passengers on its double decker A380 as the airline marks the fifth anniversary of the aircraft joining its fleet. 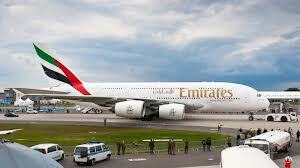 It was the 1st August 2008 when Emirates operated its first scheduled Airbus A380 flight to New York. Now, the airline flies to 21 A380 destinations including London Heathrow, Rome, Moscow, Hong Kong, Bangkok and Auckland. Over 7,000 cabin crew support a world-renowned fleet of 35 A380s, along with nearly 670 flight deck crew. Over the five years of operation, over 35 million meals have been served during 20,000 trips, spanning 265 million kilometres. In all, 37 airports have been visited, either for scheduled flights, one off special appearances or because of diversions. “Five swift years have gone by since Emirates changed the face of air travel with this remarkable aircraft,” said Tim Clark, President, Emirates Airline. “Its popularity is now firmly rooted across our six continent network, while our customers continue to enthuse about our onboard product; the overall quietness of this huge aircraft, a unique sense of spaciousness in Economy Class, mini-pod lie-flat seats in Business Class and the sanctuary of Private Suites in First Class with access to two Onboard Shower Spas.” The main talking point amongst those who have flown on the upper deck of the A380 is the Onboard Lounge, where Business Class and First Class travellers can exchange tales and talk business over a drink at 40,000 feet. All Emirates’ A380s are fitted with WiFi, allowing full connectivity with the ground. In January 2013, Emirates opened Concourse A, the dedicated home of its A380 fleet and the world’s first purpose-built facility for the aircraft at Dubai International. The concourse, part of Terminal 3, comprises 20 A380-capable contact gates, as well as Emirates’ flagship First Class and Business Class lounges, the largest in the world. The A380’s longest non-stop route on the Emirates’ network is Dubai to New York, covering 11,023 kilometres during a flight of 13 hours and 26 minutes. The shortest A380 route is between Hong Kong and Bangkok – a distance of 1,900 kilometres with a flying time of two hours 20 minutes. Some of the more quirky statistics are that since August 2008, 14 million bread rolls have been loaded onto Emirates’ A380 flights leaving Dubai, along with more than 157,000 fresh flower displays, 538,500 baby food jars, over 1 million toothbrushes and more than 4 million teabags. * Emirates is the world’s largest operator of the A380. In addition to its 35-strong fleet, the airline has a further 55 A380s on order. The full list of A380 destinations is: Dubai, Amsterdam, Auckland, Bangkok, Beijing, Hong Kong, Jeddah, Kuala Lumpur, London Heathrow, Manchester, Melbourne, Moscow, Munich, New York JFK, Paris, Rome, Seoul, Singapore, Shanghai, Sydney and Toronto. In the coming months, the A380 route network will be extended to Brisbane (1st October), Los Angeles (2nd December), Mauritius (16th December) and Zurich from 1st January 2014. Coinciding with the 5th anniversary milestone, Emirates has partnered with Google to launch the world’s first Street View of an A380, the world’s largest commercial jet aircraft. Explore online the Emirates A380’s luxurious First Class Private Suites, expansive Business Class cabin, Onboard Lounges, Shower Spas, cockpit and more on Street View. You can take a stunning, 360-degree virtual journey of the iconic double-decker by clicking here.